When I created my Hobby goals for 2016, I had no idea that Games Workshop would announce Warhammer Quest: Silver Tower just a few weeks after my original post. Needless to say, the resurgence of the 1995 classic dungeon crawler took the gaming community by storm and shot right to the top of my project list. Before I invest in Silver Tower I wanted to gain some perspective. To do that Ben and I broke open my copy of the 1995 original and were transported back 20 years to a time when every model, without fail, was based with Goblin Green. Warhammer Quest is a miniature based adventure game. The players choose a quest and take the role of four Warriors (the Barbarian, the Wizard, the Elf and the Dwarf) and hack their way through hordes of monsters (controlled by the game itself) in a randomly generated dungeon. I’ll make this point up front, there is an insane amount of content in this box. There are 30 different quests and each quest will have a different dungeon with different enemies. This is very much, Diablo: The Board Game. The final room and objective for the 30 quests is a known entirely, but everything that happens along the way is completely random. You might find the objective room after your first half dozen rooms or you may end up wandering through thirteen perilous chambers before at last reaching the objective. The randomness keeps the game interesting, but can lead to some frustrating situations as well. 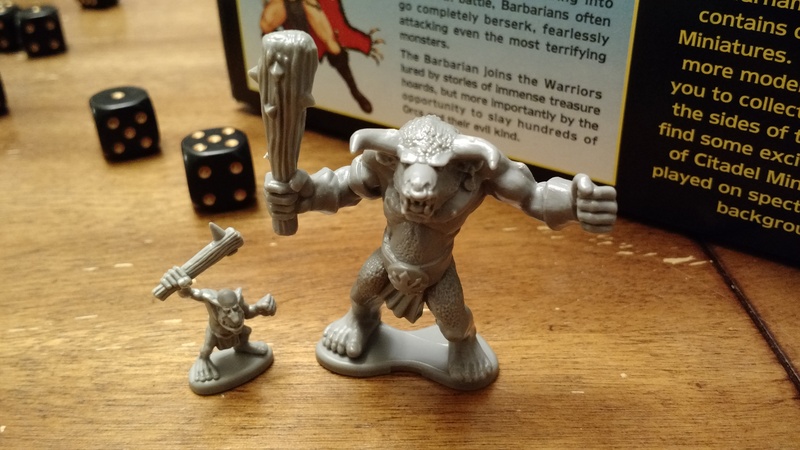 Due to the RNG nature of the dungeon itself you are just as likely to face a horde of two dozen brutish Orc warriors as you are to face two pathetic Snotlings. But be warned, life is cheap in Warhammer Quest and that lowly Snotling can quickly kill a careless Warrior. Something Ben and I learned all too quickly. The components of Warhammer Quest are top notch, especially for a game that is 21 years old. 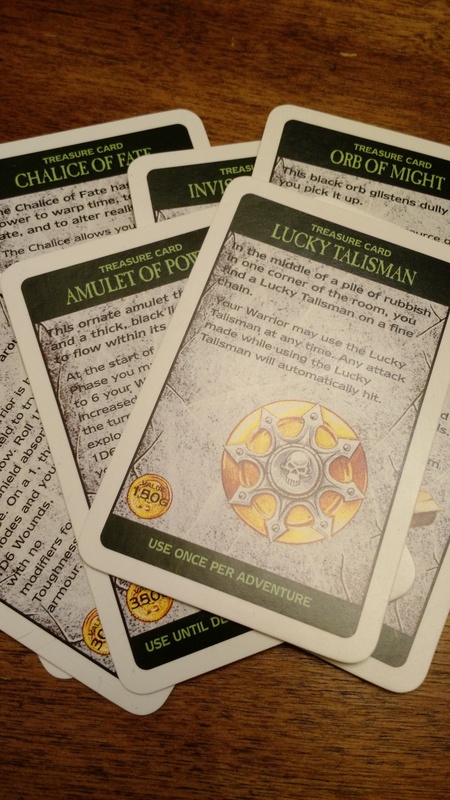 The dungeon tiles are printed on study cardstock and feature some incredible art littered with detail. 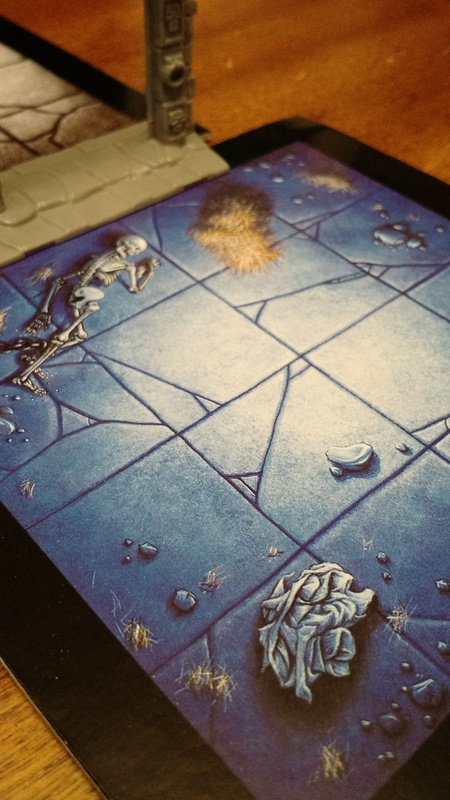 I would stand these tiles up right next to Fantasy Flight Games’ Descent or Cool Mini or Not’s Zombiecide. The miniatures included in the game are fantastic as well. All of the models are dripping with character and the classic style still holds up. I have to imagine that back in 1995 these would have been absolutely top shelf. Even after all this time, these classic Games Workshop models look great. I even have a few of the orc models painted up in classic colors. I hope to one day have the entire set painted. All of the Treasure cards feature artwork as well. It is obvious that the artists at Games Workshop were just as good back then as they are now. The gameplay itself is fast and deadly. Each turn begins with the Wizard generating power with the chance of causing an “Unexpected Event” and immediately triggering an Event Card. The Event can range from finding loot under the dead body of a previous adventurer to being ambushed by a pack of Minotaurs. Even though an Unexpected Event is only generated on the roll of a 1 on a d6, it seems to happen about forty percent of the time. After the Power Phase the Warriors have a chance to activate (move then attack) before the Monsters phase. 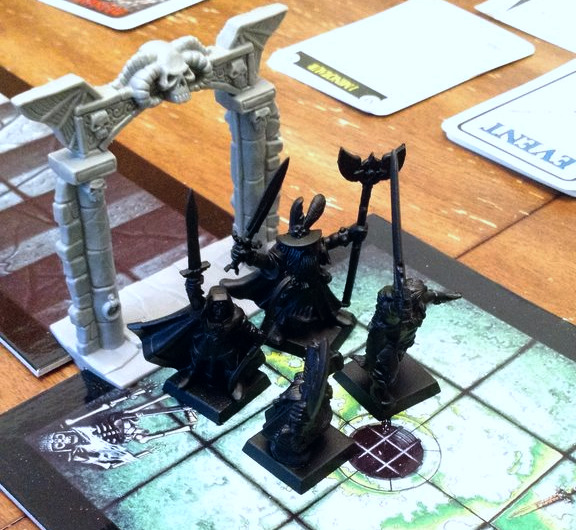 The final phase allows the Warriors to explore the dungeon further and reveal another dungeon tile. The turns move quickly from phase to phase with each Warriors turn lasting under a minute. Warhammer Quest is not a complicated game. And that is the best part. There are no unnecessary rules or mechanics. The game is pure adventure. At its core all you do is choose an adventure, set up the Dungeon Deck and roll. Nothing fancy, just killing monsters and finding loot. Now, this brings me to the Roleplay Book. With these optional rules, Warhammer Quest evolves from a pure monster-smashing-loot-grabbing extravaganza and becomes something incredible. 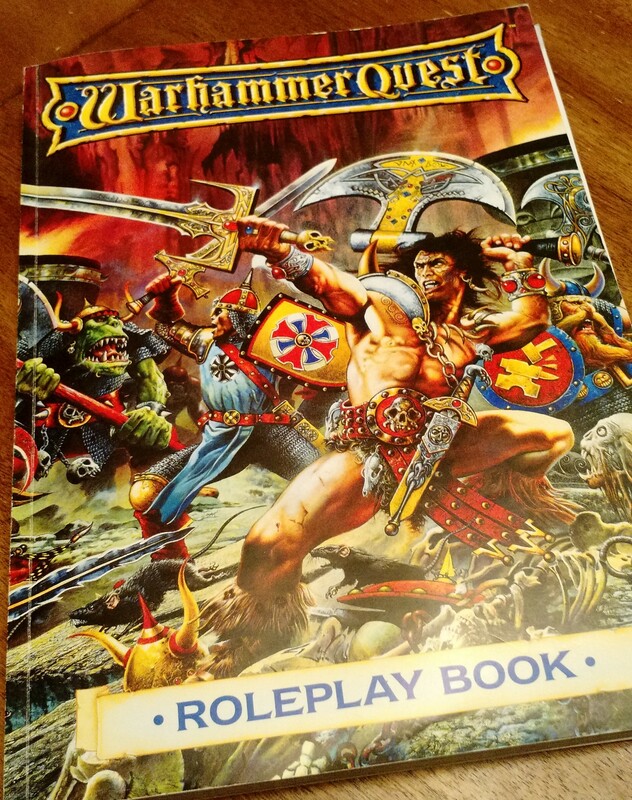 The Roleplay Book builds on the core gameplay and enhances the game with more Events, more Monsters, more Treasure and adds rules for running linked games. The ability to link your games into an ever growing campaign is what elevates Warhammer Quest to Grail Game status and is the way the game was meant to be played. Warriors can now level up, learn new skills and abilities, carry treasure over from quest to quest, purchase equipment, travel to town and engage in events during travel and while in the town itself. These rules transform the game, adding more RPG elements and allowing the players to take part in something bigger than just the dungeon crawl experience. Warhammer Quest is the type of game that creates stories. Like a great pen and paper RPG campaign, these stories are the kind you will recall with your friends for years to come. Warhammer Quest: Silver Tower has a great legacy behind it but, it also has a lot to prove. The 1995 original casts a long shadow and I look forward to finding out if Silver Tower is a worthy successor to the title of Warhammer Quest.